If there is one weapon that has truly survived the test of time, it is the slingshot. Hunters have been using this hand-powered projectile thrower for centuries. And while most weapons have gone through years of technological advancements, the slingshot has remained as it was. As such, slingshots are still as difficult to aim as they were in medieval times. The question how to aim a slingshot is one that I am sure has come up in many slingshot related conversations. Thankfully, with time and information, you can easily learn how to shoot a slingshot. In this article, I will be talking about how to shoot a slingshot accurately. Learning how to hold a slingshot is as essential as learning how to shoot it. Different people hold slingshots differently. All the same, it is recommended that you grip the frame of the catapult with your dominant arm and use the other to pull back the band. Also, use your index finger and thumb to keep the projectile firmly in place. Some slingshots come with an extra strap to help you grip the frame. If there is no such a frame grip the bottom part of the frame for stability. Before we get to learn how to shoot a slingshot, it is important to learn how to aim a slingshot accurately. Personally, I don’t think there is a universally accepted way of aiming a slingshot as different people do it differently. What I do believe is that there are some things you should keep in mind when aiming. First is your anchor point. Ideally when you are aiming you will have one hand gripping the slingshot frame and the other pulling the pouch. Some people pull the pouch backward until the hand is level with their eye-line and touching their cheeks. For others, the lip line is the preferred anchor line. So, it depends on what works for you best. It is important to keep the pouch at the centered between the forks. This is have found one of the best ways to maintain consistency in your aiming. Additionally, when you want to adjust your aim do it by moving your whole upper body. Some people only move one part of the slingshot, i.e., either the forks and frame or the pouch and rubber band. If you are new to slingshots, try moving your whole upper body when adjusting your aim. This is to ensure that you keep the pouch centered between the forks at all times. Accuracy is everything when hunting or using any weapon. The last thing you want is hitting the wrong target or missing the target altogether. With a slingshot shooting and aiming are a little bit complex since there is no sophisticated technology to help you. To become proficient at shooting accurately with a slingshot you will need to practice. 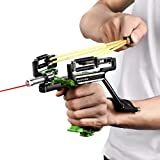 When it comes to the actual shooting a slingshot, use your principal arm to grip the frame of the slingshot and use the other to pull back the pouch containing the ammo. Next, assume a comfortable standing position. The stand I recommend for right handed people is standing with the right foot forward, and the left back and pointed slightly outwards. Before releasing the projectile take a deep breath to prevent any unnecessary bodily movement. Once you have assumed the proper stance and have taken a deep breath its time to shoot. When shooting makes sure your thumb is away from the projectile. The process of learning how to shoot a slingshot accurately is not at all complicated. However, it is important that you practice ensuring that you maintain consistency in your shooting. 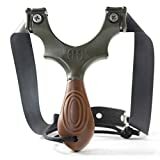 There are literally hundreds of slingshots on the market and knowing which slingshot to get for what purposes can be tricky. Nevertheless, with the right information, this will be easy to figure out. Firstly, if the purpose of getting a slingshot is hunting, go for one with a larger frame, especially if you are hunting large animals. Slingshots with small frames might not have the power to take down large animals. However, they are ideal for hunting small animals such as rabbits and other rodents. Additionally, a hunting slingshot should be lightweight yet durable. As a hunter, you do not want a weapon that weighs you down. Thus, for hunting purposes go for slingshots constructed using metals such as aluminum or synthetic materials. On the other hand, if you need a slingshot for target practice, the draw weight will be a key thing to consider. The more the draw weight, the harder it will be to shoot accurately. Also, more draw weight means you will get tired easily. This can be disheartening if you are new to slingshots. Thus, if you are new to slingshots, I recommend going for a slingshot with minimal draw weight. The draw weight is dependent on the width of the rubber band. The wider the rubber band, the more the draw weight required. For target practice stick to a slingshot with a medium width rubber band. The shape of the band will also be crucial to the effectiveness of your slingshot. For target practice where you will be using light ammo go for smaller and flexible bands. These bands have a larger surface area and are easy to work with. If you want to shoot more lethal and bigger ammo, you can go for the tubular bands. The latter bands are more powerful but less accurate than their smaller counterparts. In this regard, for self-defense and target practice small flat surfaced bands are ideal while for hunting a tubular band is needed. Lastly, while wooden slingshots look great, avoid them. These wooden weapons tend to be weak and get damaged really easy. For hunting a metallic or synthetic slingshot is more ideal. But if you want to buy a present for your kid, then a wooden one won’t hurt. Rifles and bows are today’s standard and most used hunting weapons. Nonetheless, slingshots are still widely used. And if you are thinking of joining the slingshot bandwagon, there are a few things to note. First and most obvious is that slingshots are harder to aim than their more advanced counterparts. This means they are better for close range hunting of small animals such as rodents and birds. As I stated above the best slingshot for hunting is one with a tubular band. There are several factors that you should consider when you are thinking about how to use a slingshot for hunting. The first is the kind of ammo you use. Sure, rocks can be used as ammo, but if you want to be efficient, I recommend sticking with steel balls. Steel balls are denser and pack quite the punch. Some people use lead balls due to them being denser, but personally, I do not recommend them. One because they are not environmentally friendly, two because they are not reusable, and three because they are expensive. For steel balls choose ones that have a thickness of between seven-sixteenths and one and a half inches. Due to them being hard to aim, slingshots are best suited for close range hunting. Before firing stalk your prey to a distance of about 30 feet. With the right ammo and a powerful enough slingshot, this distance will be enough to take down a rodent. When stalking prey learn to be patient and be still. Rabbits and squirrels pose before running away, and this presents you with a good opportunity to fire a kill shot. Practicing your stalking and stealth skills is important if you want to be successful at hunting with a slingshot. Are slingshots designed for taking down small animals only? This is a question you probably have come across. The ammunition used on these weapons lacks the power to take down a fully-grown deer. Additionally, irrespective of how strong you are, your hands can never substitute a powerful rifle or bow. Nevertheless, with some modifications, it is possible to take down large prey with a catapult. The slingshot will need to be modified to use arrows. Alternatively, you can buy one that is designed to fire arrows as well. These types of catapults are available online and can be used to fire arrows. Before using you will need to re-size your arrows to fit the slingshot. Based on my experiences with slingshots, here are some useful slingshot shooting tips. To be accurate at your shooting, the arm you use to grip the slingshot should point straight to the target. Additionally, it should be parallel to the ground. When you pull back the rubber bands, ensure that they are perpendicular to the frame of the slingshot and parallel to the forearm of the arm you use for gripping. To make hitting your target easy and comfortable, hold the slingshot in a vertical manner. Also, your wrist and forearm should be aligned. The ammunition you are using should be placed at the center of the leather pouch. Fold the pouch over the projectile and hold it firmly. Using a slingshot is not as complicated as using other hunting weapons. The reason being that they do not come with the sophistication of rifles and bows. However, there is a lot that goes into learning how to use a slingshot. Overall, a catapult is one of the best weapons to use for close range stealth hunting.